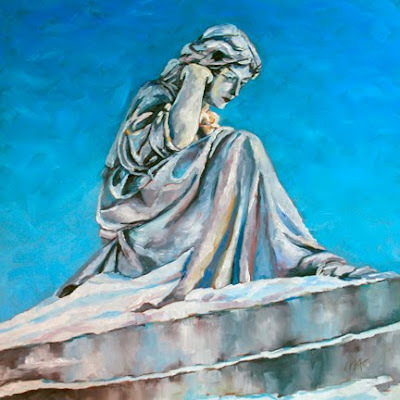 The name for this painting was difficult, it is a statue from an historic cemetery I just toured in Portland. I have never been there before, seeing it is not near my neighboring haunts :), and was astonished by it's beauty. I can't wait to go back and hopefully do a guided walking tour(in warm weather). I really don't have a lot of info, but it is on the national historic register and is filled with beautiful statues and sculptures of the victorian era. It has a walking trail and wetlands, so it is also a wildlife habitat of sorts and is used by the Audubon for bird migratory studies. There was snow cover and a lot was hidden, and I did not find any names or history on the statues I photographed. But after painting this sweet, angelic figure I would love to find out more! I really loved this study and felt there must be a story and now I need to know. As I was enlarging the photo on the computer, I even noticed the eyes are blue, and the lips are red which was a big surprise, the eyes matched the color of the sky, it is captivating! Wow! What a beautiful painting! You handled the color in this one absolutely perfectly!